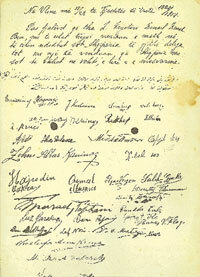 As with many events of Albanian history, the declaration of independence of 1912 was somewhat of an impromptu affair. The Ottoman Empire collapsed in the first Balkan War that began in October 1912 and the Albanians found themselves in an extremely awkward position. Their leaders were more concerned about the coalition of neighbouring Christian forces (Montenegro, Serbia and Greece) than they were about the weakened Ottoman military presence in their country. What they wanted was to preserve the territorial integrity of Albania. Within two months, Ottoman forces had all but capitulated, and it was only in Shkodra and Janina that Turkish garrisons were able to maintain position. The very existence of the country was threatened. It was at this time that Ismail Kemal bey Vlora (1844-1919), also known in Albanian as Ismail Qemali, returned to Albania with Austro-Hungarian support and, at the head of a swiftly-convened national assembly, declared Albanian independence in the town of Vlora on 28 November 1912. The declaration was more theoretical than practical because Vlora was the only town in the whole country under the delegates’ control―yet it proved to be effective in the vacuum of power. 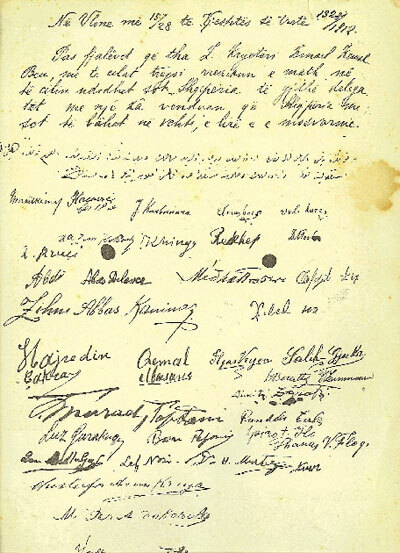 Though Albanian independence was recognised de facto on 17 December 1912 at the London Conference of Ambassadors, it was not until 29 July 1913, after the second Balkan War and the solving of the delicate problem of Shkodra, that the international community agreed to recognise Albania as a neutral, sovereign and hereditary principality. Given below is a report, published in the Vlora newspaper “Përlindj’ e Shqipniës,” describing the events leading up to the Declaration of Independence in Vlora, and then the short text of the Declaration itself. The National Assembly, composed of delegates from all over Albania and convening here in Vlora, opened today at four in the afternoon at the house of Xhemil bey. Ismail Kemal bey, as the prime initiator of the gathering, took the floor and explained to the delegates the purpose of the assembly, that is, that they all must strive to do what is necessary to save Albania from the great perils it is now facing. from the Albanian colony of Bucharest: Dhimitër Zografi, Dhimitër Mbroja, Dhimitër Beratti and Dhimitër Ilua [Ilo] (the latter still awaited). 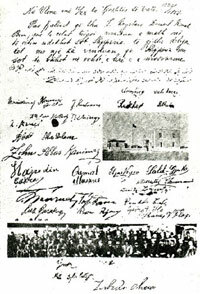 After checking the documents, Salih Gjuka took the floor and stated that since Korça was currently surrounded by the army and could not send delegates, since its patriotic spirit was known and since in their midst there were gentlemen from Korça known, too, for their patriotism, these men, Pandeli Cali, Athanas Floqi and Spiro Ilua, should be recognised as representatives of Korça. The gathering gave its unanimous agreement to this and approved this decision. Mustafa Asim Efendi requested that Shkodra, for its part, that was in a worse state than Korça, be represented by Luigj Gurakuqi who had represented it in the other national gatherings and who was one of the initiators of that meeting. The assembly once again gave its unanimous approval and agreed to Luigj Gurakuqi representing Shkodra. 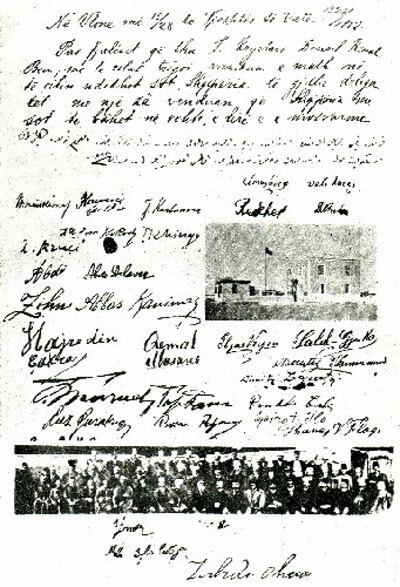 From Përmet came telegrams stating that if its delegate, Veli bey Klisura, did not get to Vlora, he should be represented by Syreja bey Vlora and Mid’hat bey Frashëri. Another telegram arrived from Hamdi bey and Mustafa Barotçiu who announced that they, too, would be arriving as delegates for Ohrid and Struga. Thereafter, Rexhep bey took the floor and stated that Ismail Kemal bey ought to be elected chairman of the assembly, Luigj Gurakuqi as first secretary and Shefqet bey Daiu as second secretary. The delegates agreed to this request and elected the proposed men, who were heartily applauded. The issue of voting was then brought to the fore and, after much discussion, it was decided that each region (kaza) should have only one vote, irrespective of the number of delegates it had. Mustafa Asim Efendi pleaded that the present Albanian question and the country’s situation ought to be made very clear to European public opinion. This decision was greeted by endless applause from all sides. The meeting was adjourned until the following day and the delegates went out and greeted the flag that was raised at five thirty in the afternoon. 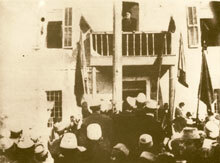 Ismail Kemal bey was chosen as president of the Provisional Government and Dom Nikollë Kaçorri as its vice-president. in Vlora, on the 15th/28th of November 1328/1912. Following the speech made by the President, Ismail Kemal Bey, in which he spoke of the great perils facing Albania today, the delegates have all decided unanimously that Albania, as of today, should be on her own, free and independent.